In one hand, you hold a commemorative glass filled with award-winning wine, in the other, a plate of artfully prepared seafood. Unfortunately, that leaves zero hands to wrap your coat a little tighter around your body and fend off the coastal winter chill. But hear ye, hear ye, (cue the sound of trumpets), this year, all of the 54,000 square feet of tenting that houses the Newport Seafood & Wine Festival will be gloriously filled with heat. And so gone are the days of needing to swaddle oneself in down, flannel and fleece. According to Bobbie Price of the Newport Chamber of Commerce, there is a sunnier outlook there as well. While meandering along the now-widened lanes, you can cozy up to makers of more than 150 northwest wines, many of whom came away from the recent Newport Wine Competition with new bling. The amateur competition was sparkly as well, with nine gold and 14 silver awards given. With all that award-winning wine to try, organizers strongly encourage festival goers to use the free shuttles that stop at many of the local hotels, motels and Newport neighborhoods. “There is going to be a purely non-alcoholic booth serving mocktails,” Price said. Though food vendors will be serving up a wide range of delicious creations crafted from salmon, shrimp, Dungeness crab, oysters and more, Price said there will also be options for those who don’t like or are allergic to seafood but who want to attend with someone else or just want to enjoy the, (did I mention this yet?) heated tents. This year’s theme, “Meet me by the Sea,” is intended to remind people that there is plenty going on outside the tents if they are visiting Newport. And remember, if you are playing outside and get cold, head back to the festival because, (there’s those trumpets again) THE TENTS ARE HEATED. Yes, those hardy folk that stay in one place for the entirety of the four-day event must have let out a collective sigh of relief when they heard the wonderful news. The very long list of vendors, wine competition winners and answers to frequently asked questions can be found on the event website, seafoodandwine.com. One of the things that has helped ease the crowds in recent years has been the introduction of an e-ticket-only policy for Saturday, historically the festival’s busiest day. That has been so successful, however, that organizers are easing up on the policy for the afternoon. But some things still continue, and that’s a good thing. 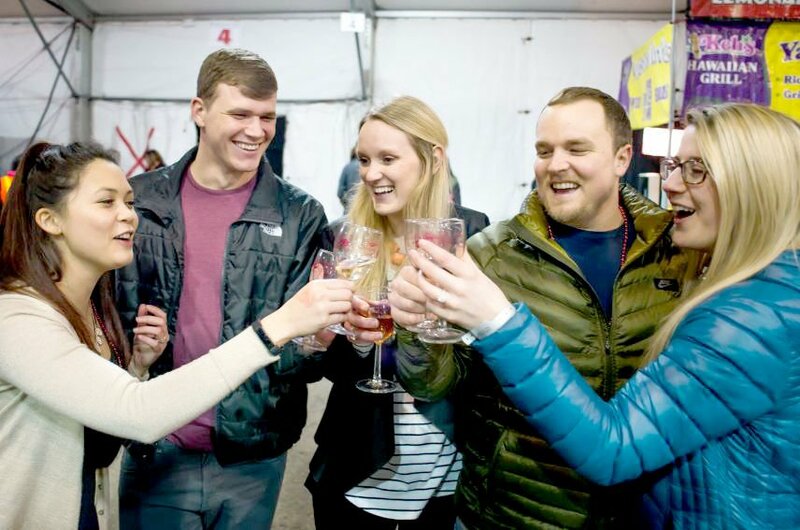 The Newport Seafood & Wine Festival, a 21-and-over event presented by Chinook Winds Casino resort, runs from Thursday, Feb. 21, through Sunday, Feb. 24 next to Rogue Ales in South Beach. Thursday, Feb. 21, 5 to 9 pm, $26. Friday, Feb. 22, noon to 9 pm, $27. Saturday, Feb. 23, 10 am to 6 pm. $32. Sunday, Feb. 24, 10 am to 4 pm, $18. Special three-day pass for Friday through Sunday, $38. All ticket prices include a commemorative wine glass. Ticket prices do not include wine tasting or food. Wine sampling starts at $1 and glasses of wine are available for menu price. For more information, call 800-262-7844 or go to www.seafoodandwine.com.